Kokabe is a small village with at least three excavation sites, viz. an ancient monastery, an ancient forest hermitage with a large rock inscription, and a pre-Buddhist burial place recently excavated. To be honest, the Kok Abe ruins are not a must-see, but the location is pretty charming and completely untouched, an off-the-beaten-path destination par excellence, as this place is not mentioned in any guidebooks. Backpackers and other independent travellers usually do not visit places not listed in their pocket guide. Kokabe village is located 35 km to the east of Mihintale and 41 km to the north of Ritigala and 10 km to the east of Kahatagasdigiliya. The group of ruins is situated 3 km to the south of the Kokabe hill, as the crow flies. 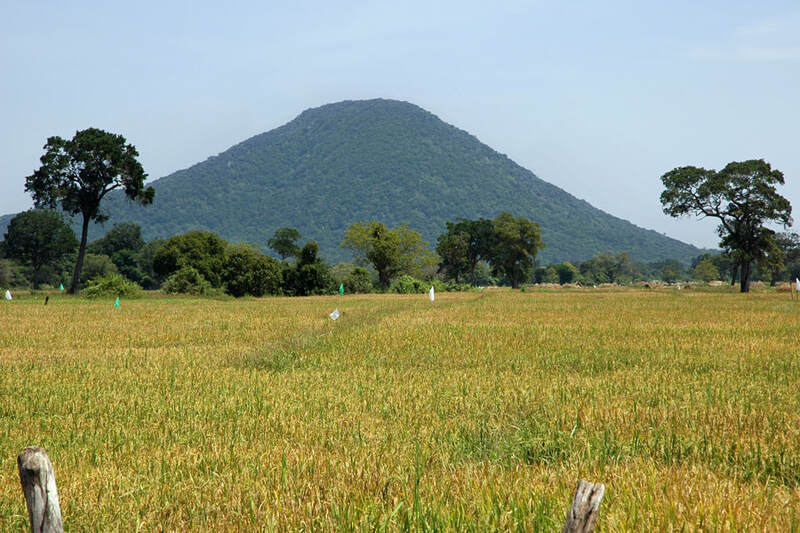 The peak marks the highest elevation in the Kahatagasdigiliya division of Anuradhapura District. The jungle at this hill is a wildlife area. Leopards and sloth bears occur, though they are rarely sighted. But there is a risk of encountering wild elephants. There are many different spellings of Kokabe. It’s stresse on the last syllable and pronounced as two separate words, this is why “Kok Abe” or “Kok-Abe” are possible transliterations, too. Other spellings are Kok Ebe, Kokobe, Kokabae, or Kokabay. Kok is a Sinhala word for a stork. The ancient name of the ruined monastic complex just north to the village is Budulanda. However, you will hardly find this name mentioned in your books. 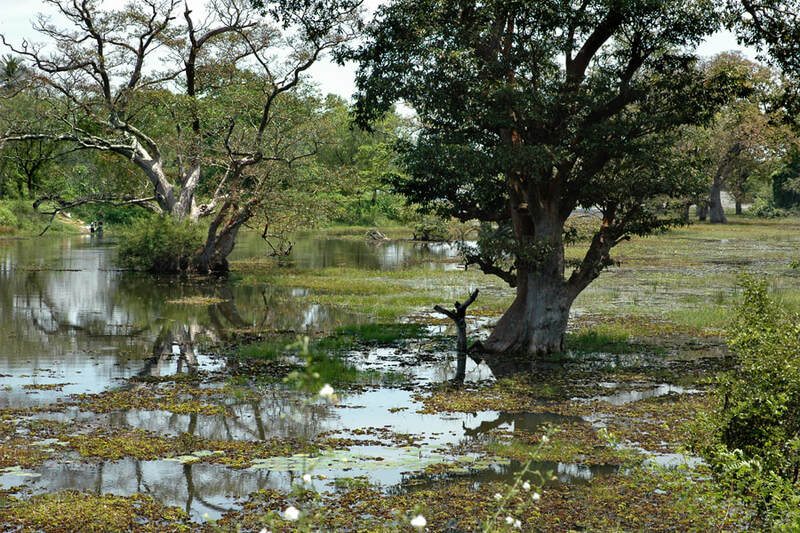 The excavation site is indicated by a board of the archaeoligical department at a sharp turn of the road, near a partly overgrown tank, Ihalakubukgallawa Wewa by name. The footpath to the excavation site is 500 m long. 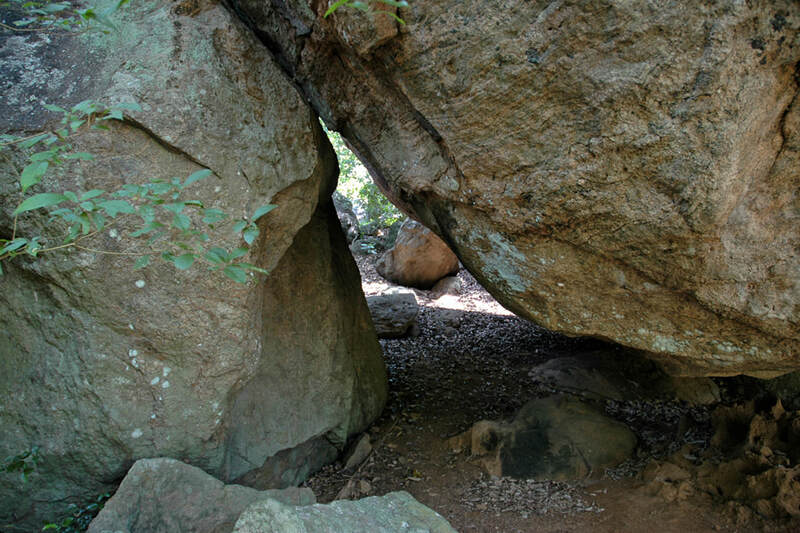 Halfway to the brick structures, there are rock shelters on the rigthand side, they were inhabited by monks in the early Anuradhapura period, as can be seen by drip ledges and inscriptions in Brahmi charakters on the back of the rock. The main excavation site is comparatively small. 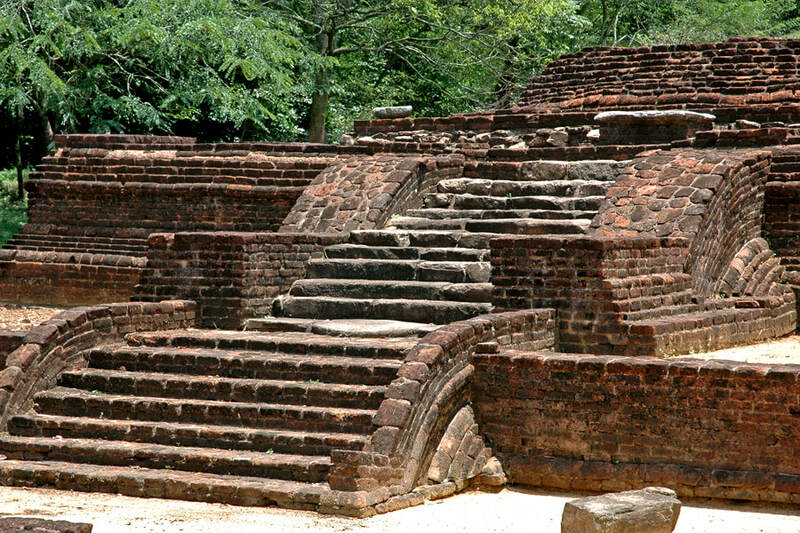 There are foundation walls of several brick buildings from the late Anuradhapura period. The most interesting one is at the upper end of the path. In fact, this is a combination of two buildings. The larger one is a common stupa, now partly broken. The other one, in front of it on the lower terrace is noteworthy for several reasons. The balustrades of its gateway consist of a vaulted brick structure. This non-horizontal way of brick construction is rather uncommon at temple entrances. The interior of the almost square building has monolithic pillars in its corners, which once carried a roof, presumably made of wooden beams and tiles. However, the roof could have had an opening in the centre, making this structure an atrium-like type of architecture. In this case, it was presumably a Bodhigara. Then a tree was the main object of worship in this room, its crown overarching the roof. A deepening that can still be seen in the centre would have been the spot where the Bo-tree was placed. Bodhigaras, “tree-houses”, were known from ancient scriptures and also from ancient depitions. But until the 1930th, no such structure was excavated. 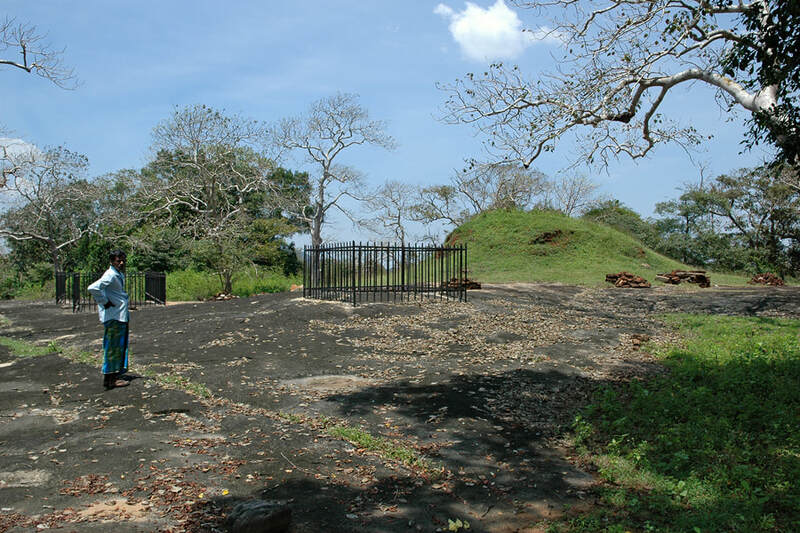 Ceylon’s most famous archaeologist, Paranvithana, was jubilant to identify the small temple of Nillakgama to the south of Anuradhapura as an ancient Bodhigara. Since then, several Bodhigaras have been found in Sri Lanka, though not as well preserved as that in Nillakgama. It’s not entirely clear, whether this structure in Kokabe was actually a Bodhigara. There is an interesting alternative theory put forward by Charles Edmund Godakumbura (1907-77), who was a deputy of Paranavithana and his successor as Commissioner of Archaeology in Ceylon from 1956 to 1967. Godakumbura suggested, this monument in Kokabe could have been an Asanagara, also spelt “Asanaghara”. This type of building too is known from ancient literature and ancient stone carvings, particulalry from reliefs at the stone railings of the ancient stupa of Bharhut, now on display in the Kolkata Museum (Calcutta). Asanagaras are shrines in which the main object of worship is a an altar interpreted as a stone throne. The term "Asanagara" means "seat house". "Asana" is a term for both the pediment a Buddha statue is seated on and the type of posture of the Buddha, viz. the way he is seated. In an Asanagara, there is no statue but only the throne, an aniconic representation of the Buddha, comparable to Sripadas, footprints, that are symbols of the Buddha without depicting his body. The huge monolithic table top close to the centre of this building could have been such an Asana, without a statue and without another main object of veneration within the shrine room. Only one torso of a Buddha sculpture was excavated in Kokabe, its size was definetely not that of a Buddha seated on such a large Asana throne. An empty throne is a symbol for Buddha’s mental souvereignty and power to overcome the world. Aniconic representations of the Buddha are earlier than statues. 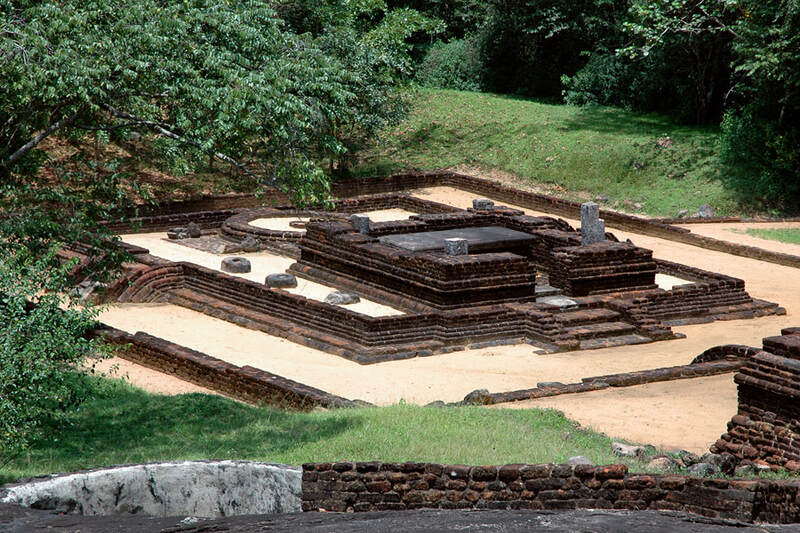 Though this building is actually not earlier than the occurence of Buddha statues in Sri Lanka, it could represent an earlier type of architecture. Sri Lanka’s excavated Bodhigaras too are from the late Anuradhapura period but continue to worship a tree instead of a statue as the main object inside the temple as a symbolic representation, in this case of the Buddha’s enlightenment. However, in case this structure was a Bodhigara instead of an Asanagara, the occurence of the huge Asana table would not be condusing, as Bo-trees were usually surrounded by Asanas, most commonly in all four directions. But only one huge Asana in front of the tree would not be in contradiction to the assumption that the tree was the main object of worship – and thereby the monument would have been a Bodhigara. In this case, it was a Bodhigara with a large stone throne singled out as a second object of veneration. Nevertheless, that an Asana is such a dominating feature in an ancient temple, is the most extraordinary aspect of this small excavation site in Kokabe. On the opposite southern side of the village of Kokabe is another ancient site. 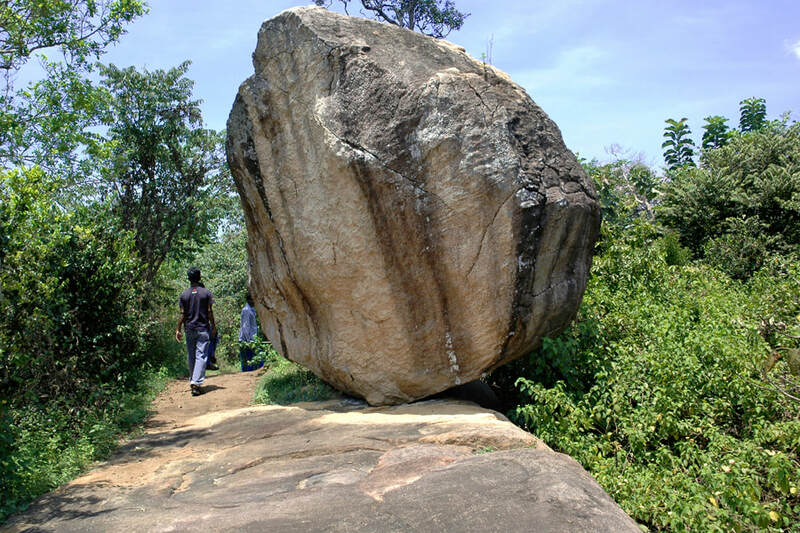 It is one of the many places in this area to the east of Anuradhapura where so-called stone beds were found, simple flat rock surfaces, slightly elevated. The Buddhist monastic rules did not allow monks to use comfortable beds. Stone beds are carvings considered to be from the early Anuradhapura period. 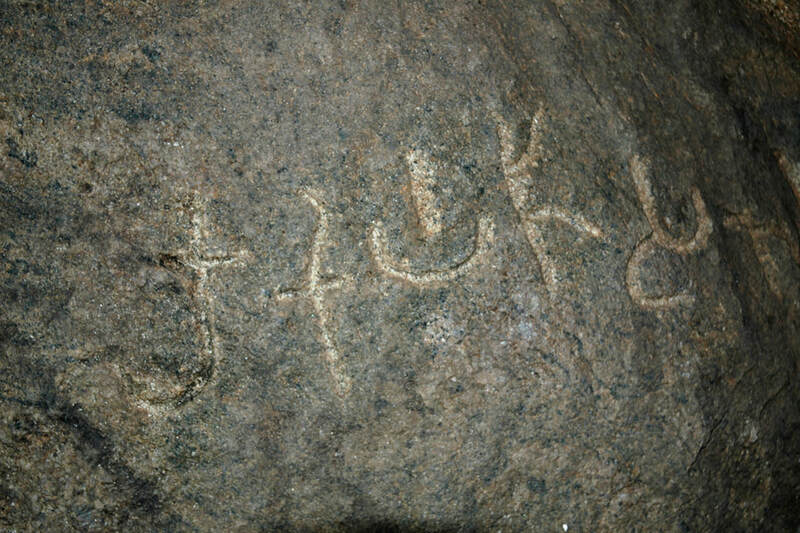 Close to the stone bed of Kokabe, which is in a quite dilapidate condition, is a huge rock inscription from the early centuries A.D. It mentions an administrational officer in Rohana, a Bojaka. This indicated control of southern Sri Lanka by royal officials from Anuradhapura during this period. 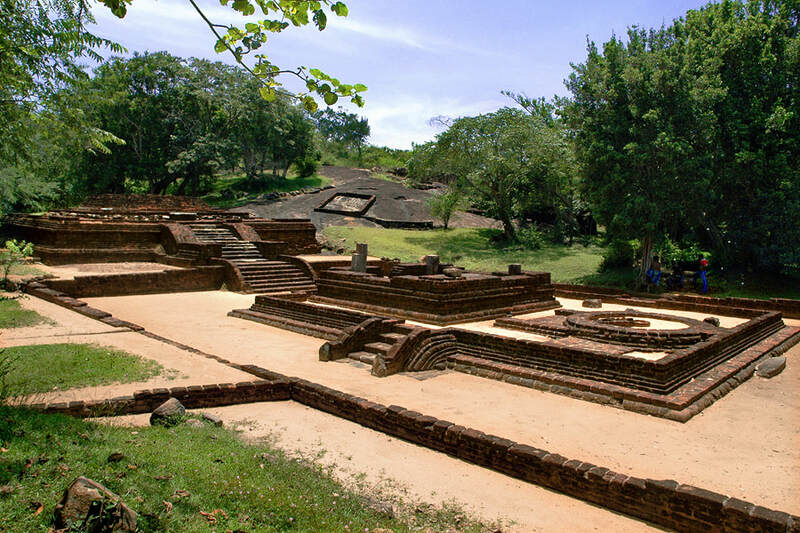 During the later centuries of the Anuradhapura period, southern Sri Lanka consisted of prinicipalies almost independent from the Anuradhapura kingdom. There is another small but noteworthy heritage site at Kokabe. In 2016, the Department of Archaeology excavated a presumably pre-Buddhist burial site. It was a cist burial of considerable size. Ceramics were recovered at the burial place, too.